This jewelry box emerged from the Genesis jewelry box. 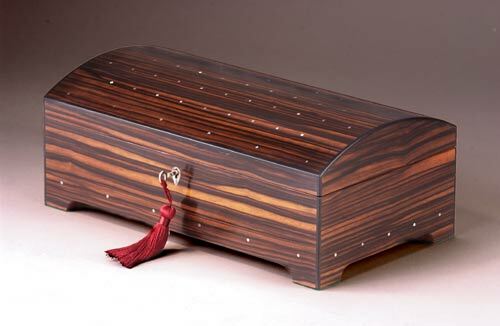 The abalone inlays over the warm macassar ebony are reminiscent of stars spread across an evening sky. The integral feet lift the box so it sits lightly on the surface where it is placed. The interior is a brilliant curly maple. An abalone escutcheon covers the protects the keyhole of the working lock.